Background: The root cause of intertrochanteric femoral fracture in elderly patients is osteoporosis manifested by reduced bone strength, decreased bone mineral density, and subsequently decreased anchoring between the internal fixator and bone. This is also a major cause of ineffective internal fixation and leads to surgical failure. Because of the special anatomical structure and biomechanical requirements of the proximal femur, internal fixation must have two basic functions, to prevent inversion and rotation of the proximal fractured femur. Reducing the incidence of coxa vara is also one of the treatment objectives. Methods/Design: This is a single-center, prospective, self-controlled case series. The objective of this study is to validate the safety and effectiveness of minimally invasive proximal femoral nail antirotation (PFNA) in the treatment of intertrochanteric femoral fracture. Twenty patients with intertrochanteric femoral fracture scheduled to undergo PFNA implantation will be recruited from the Department of Orthopedics, Chaohu Hospital of Anhui Medical University, China. The primary outcome measure of this study is the percentage of patients having PFNA implantation-related safety problems manifested as pain in the affected region, wound nonunion, incisional infection, and gross findings observed at the time of nail removal, including inflammatory reaction, tissue proliferation, and the appearance of a fibrous capsule wall 3 and 6 months after PFNA implantation. The secondary outcome measures are operative time, intraoperative blood loss, duration of intraoperative fluoroscopy, patients' quality of life evaluated by the EuroQol five-dimension questionnaire and the Barthel Index of Activities of Daily Living, fracture healing examined by X-ray images, and hip joint function evaluated by Harris hip scores 3 and 6 months after PFNA implantation. Discussion: The currently reported clinical studies on PFNA for the treatment of intertrochanteric femoral fracture are mainly case series, a few of which are retrospective, randomized, controlled trials. Here, we will perform a normalized prospective case series to validate the safety and effectiveness of PFNA in the treatment of intertrochanteric femoral fracture. Trial registration: ClinicalTrial.gov identifier: NCT02880501; registered on 18 August 2016. Ethics: This trial has been approved by Ethics Committee, Chaohu Hospital of Anhui Medical University, China and will be performed in accordance with the Declaration of Helsinki, formulated by the World Medical Association. Informed consent: Signed informed consent will be obtained from the patients or their relatives. Intertrochanteric femoral fractures occur frequently in the elderly, are often unstable and often complicated by osteoporosis. This disorder is also frequently complicated by various chronic diseases, making patients poorer surgical candidates. Surgery is the most widely accepted treatment method of intertrochanteric femoral fracture (Simmermacher et al., 2008; Mereddy et al., 2009; Ruecker et al., 2009) because it can accelerate recovery and reduce the complications caused by a long confinement to a bed (Bergeron et al., 2009). Because intertrochanteric femoral fractures are unstable and occur mostly in the elderly, surgical treatment should prioritize reducing the risks of wound infection and intraoperative blood loss, and have strong holding potential and implant stability. Efforts should be made to encourage early hip joint exercise and to facilitate recovery after surgery. Intramedullary and extramedullary fixations are commonly used. Compared with extramedullary fixation, intramedullary fixation places fixators closer to the affected region, produces shorter moment arm of force, better shares the compression forces on the medial cortex of the femoral neck, exhibits higher shear resistance, and provides greater stabilization for complex fractures in the elderly (de Vries et al., 2006; Kuzyk et al., 2009). Association for Osteosynthesis (AO) proximal femoral nails have an antirotation screw in their proximal end, ensuring an elastic fixation of the fracture and reducing complications, such as femoral shaft fractures when compared with Gamma nails. Nevertheless, two screws should be installed in the femoral neck, restricting the slippage between the main screw and the compression screw. This reduces partial loading delivered through the antirotation screws, leading to complications of antirotation screw cutting and compression screw withdrawal (Helwig et al., 2009). Conventional internal fixation methods, including dynamic hip screws, Gamma nails, and proximal femoral intramedullary nails, exhibit unfavorable effects in the treatment of intertrochanteric femoral fracture. In particular, fractures complicated by severe osteoporosis are at risk because these methods cannot achieve firm and reliable fixation with occasional nail head cutting and nail withdrawal. Therefore, the Association for Osteosynthesis/Association for the Study of Internal Fixation (AO/ASIF) designed a novel antirotation intramedullary nail, which better reduces the risk of these complications (Helwig et al., 2009). Proximal femoral nail antirotation (PFNA) is a device based on proximal femoral and other intramedullary nails. This device is equipped with a wide spiral blade which exhibits antirotation and angular shear stress abilities, greatly reducing complications and decreasing the possibility of surgical delay (Mereddy et al., 2009). Compared with conventional screw systems, PFNA provides stronger antirotation and anti-inversion abilities (Mereddy et al., 2009). For tapping of a spiral blade in the femoral neck, only the lateral femoral cortex should be opened, without the need to remove bone matrix. The spiral blade tapped in the femoral neck will produce compression to the bone. For patients with severe osteoporosis, the spiral blade in the femoral neck can produce a firm anchoring force. Compared with screw fixation, a spiral blade exhibits a larger rotational torque, requires less strength to be pulled out, and does not need additional screws tapped in the femoral neck. The PFNA has a medial-lateral angle of 6°, allowing insertion at the tip of the greater trochanter. The distal diameter of the PFNA is relatively small, and its eccentricity is less than that of intramedullary nails, making it more suitable to the anatomical morphology of the proximal femoral medullary cavity. The locking pores at the PFNA's distal tip include round static and oval-shaped dynamic types. Vertical installation of screws is considered dynamic interlocking and oblique installation of screws is static interlocking. From a design perspective, PFNA exhibits better biomechanical stability and shows advantages in operative time, intraoperative blood loss, surgical failure rate and overall complications compared with internal fixation methods (Huang et al., 2012). 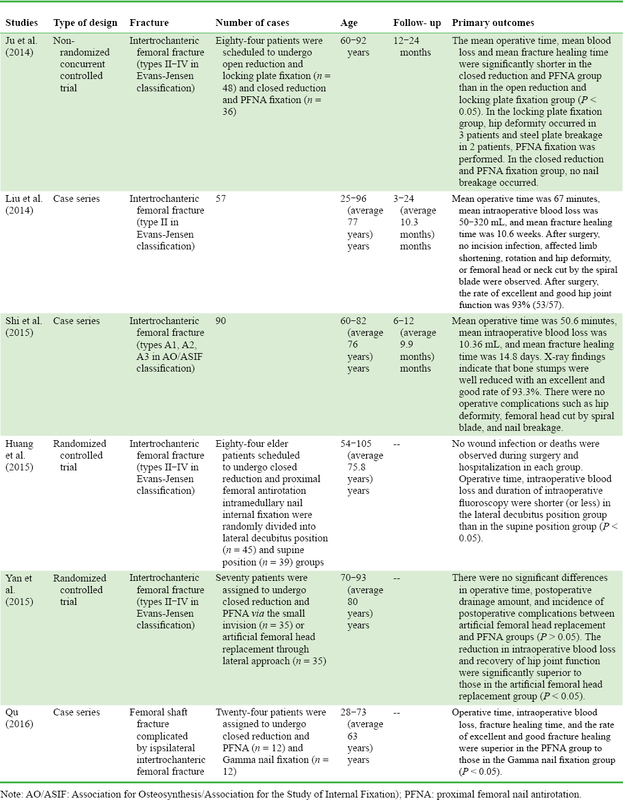 Use of PFNA for the treatment of intertrochanteric femoral fracture has been reported in many cases, but related studies are mainly retrospective case series, with a few retrospective randomized controlled trials [Table 1] [Table 2] [Table 3]. To evaluate the safety and effectiveness of minimally-invasive PFNA fixation in the treatment of intertrochanteric femoral fractures in 20 patients over 2 years. Progress: PFNA is a device based on modification of the Gamma nail and integrating the advantages of dynamic hip screws (DHS) used for extramedullary fixation and intramedullary fixation devices. This new device exhibits advantages over DHS, including smaller stress shielding, better fracture healing, and reduced cut-out phenomenon, and it better shares the compressive stress of the medial femur, leading to lower incidence of hip deformity. Both proximal femoral intramedullary nails and PFNA are intramedullary fixation devices, but the latter has several advantages. These include the ability to achieve antirotation and angular stability with a single assembly, the ability to compress as much peripheral matrix as possible with the wide blade at the tip, giving better holding potential with concurrent osteoporosis, better implant stabilization, antirotation protection and varus deformity protection due to the PFNA's blade being more closely attached to the matrix, greatly increased shearing capacity due to the spiral blade, and implantation via a lateral incision resulting in a minimal wound, less bleeding, satisfactory reduction, rapid recovery, highly stable fracture stumps, earlier return to exercise, avoidance of prolonged force arm caused by extramedullary fixation, and increased shear stress in the proximal femur, which greatly reduces the possibility of failure. Feasibility: intramedullary nails have been widely used for the treatment of long bone fractures and expert consensus has been achieved. Using this novel PFNA for the treatment of intertrochanteric femoral fracture in elderly patients produces a minimal wound and is easily performed, making it highly feasible for clinical use. We prepared for this project in many capacities: (1) personnel: this project will be equipped with two chief physicians, two associate chief physicians, three attending physicians, two resident physicians, and one graduate student. Our team has strong clinical and scientific research abilities; (2) techniques: our experienced team has performed open or closed reduction and intramedullary nail fixation in many patients, and has sophisticated surgical skills for orthopedic trauma and joint surgery; (3) equipment: the study setting is equipped with an orthopedic traction bed, X-ray, computed tomography (CT) scanner, magnetic resonance (MR) scanner and other equipment, all with the necessary hardware and software support. Safety: Under fluoroscopic guidance, closed reduction will be followed by minimally invasive intramedullary nail fixation, effectively avoiding vessel and nerve injury. A prospective, self-controlled case series. Department of Orthopedics, Chaohu Hospital of Anhui Medical University, China. Potential patients will be screened against our inclusion and exclusion criteria (see below). After providing informed consent and completing a baseline evaluation, 20 eligible patients with intertrochanteric femoral fracture will undergo PFNA treatment. 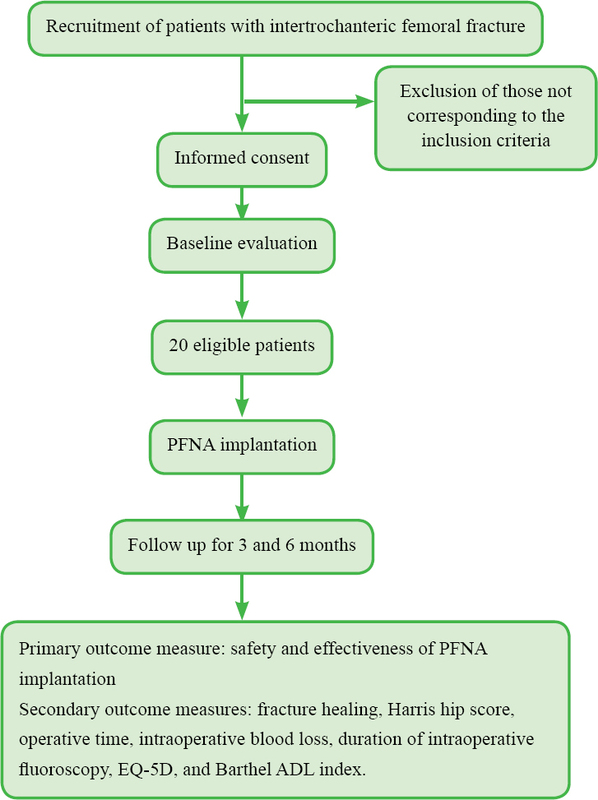 The primary outcome measure of this study is the percentage of patients having PFNA implant-related safety complications, manifested as pain in the affected region, wound nonunion, incisional infection and gross findings observed at the time of nail removal and at 3 and 6 months after implantation, such as inflammatory reaction, tissue proliferation, and appearance of a fibrous capsule wall. Secondary outcome measures include fracture healing as determined by X-ray images and hip joint function as evaluated by Harris hip scores 3 and 6 months after PFNA implantation, and operative time, blood loss, duration of intraoperative fluoroscopy, patient's quality of life as evaluated by the EuroQol five-dimension questionnaire (EQ-5D), and the Barthel Index of Activities of Daily Living (Barthel ADL Index). The flow chart of this trial protocol is shown in [Figure 1]. Note: PFNA: Proximal femoral nail antirotation; EQ-5D: EuroQol fivedimension questionnaire; Barthel ADL index: Barthel Index of Activities of Daily Living. Twenty patients with intertrochanteric femoral fracture scheduled to undergo treatment in the Department of Orthopedics of Chaohu Hospital of Anhui Medical University will be included in this study. This is a case series. As per the requirement for minimum sample size of a clinical trial, 20 patients with intertrochanteric femoral fracture will be included. Sample size calculation will follow the intention-to-treat principle. After providing signed informed consent, patients' baseline data will be evaluated prior to PFNA implantation, including gender, age, body height, body mass, cause of injury, date of admission, American Society of Anesthesiologists (ASA) classification, history of diseases (diabetes mellitus, cardiovascular disease, lung disease, peripheral vascular disease, dementia, hypertension), history of smoking, history of alcohol use, laboratory examination, X-ray examination, Harris hip score, EQ-5D, and Barthel ADL index. The baseline data of 20 included patients are shown in [Table 4]. Patients in the wards and clinics of the Chaohu Hospital of Anhui Medical University will be informed about the trial by their attending physician. Patients who are interested in participation in the trial can contact the responsible researchers via telephone, e-mail or WeChat. Following general anesthesia or lumbar anesthesia combined with epidural anesthesia, patients will be placed in the supine position on an orthopedic traction bed with both lower extremities bound by a foot support frame. For closed reduction, the affected limb will be externally rotated and then subjected to longitudinal traction, followed by inward rotation. The affected limb will be inwardly adducted 10-15° relative to the trunk, and the foot will be inwardly adducted to correct the anteversion angle and avoid excessive traction and coxa vara. After closed reduction is confirmed under C-arm fluoroscopy, the surgical area will be routinely sterilized, and a 4-6 cm long longitudinal incision will be made 4-6 cm above the vertex of the femoral greater trochanter. The gluteus minimus and medius muscles will be separated in the direction of the muscle fibers and the vertex of the greater trochanter will be palpated. Using an anterioposterior approach, an entry point will be selected at the center or slightly lateral to the vertex of the greater trochanter and an intramedullary guidance needle will be inserted. Under the protection of a specially designed sleeve, a pore will be drilled using a hollow drill along the guidance needle to expand the intramedullary cavity. The main nail of the PFNA will be inserted into the proximal femoral intramedullary cavity along the direction of the guidance needle. A lateral sight will be installed. A 2-cm long incision at the area palpated by a guide bit of the spiral blade will be made and a sleeve will be inserted through the lateral sight until it reaches the lateral femoral cortex. Under the protection of the sleeve, the guidance needle will be tapped into the femoral neck to 5-10 mm below the articular surface cartilage of the femoral head. After position confirmation using fluoroscopy, the guidance needle will be placed parallel, inferior and lateral to the central axis of the femoral neck. The length of the spiral blade will be measured, and a pore will be made on the lateral femoral cortex and an appropriately sized spiral blade will be tapped. After another fluoroscopic position confirmation to ensure satisfactory positioning for internal fixation, the tail cap will be screwed, and the wound washed and sutured. Reconsideration of minimally invasive surgery: the entry point for conventional intramedullary nails is located in the femoral fossa and the main nail of the PFNA will have a 6° deflection angle which will facilitate the insertion of the PFNA from the vertex of the greater trochanter. The approximately 5-cm surgical incision will initiate 4-6 cm above the vertex of the greater trochanter and continue along the long axis of the femur. Therefore, there is no need to expose the fractured stump. To better protect the blood transport environment, the periosteum and soft tissue at the fracture site will not be stripped, and the anatomic position of fractured stump is not limited. To protect the bioenvironment of the fractured stump, closed reduction and functional reconstruction will be performed, requiring only a small surgical wound and providing reliable outcomes. No intramedullary cavity expansion should be needed after expanding the mouth made at the proximal intramedullary cavity. During surgery, the main nail should be slowly inserted by hand and surgeons will avoid hammers or brute force to force the nail into the intramedullary cavity. This will avoid displacement of the fractured lump and iatrogenic fracture. Small incisions can make fractures difficult to reduce by traction. A bone hook and/or Hoffman hook will be used for fracture reduction. For unstable type A3 intertrochanteric femoral fractures, when the main nail of the PFNA is inserted, the lateral part of the femoral greater trochanter should be restrained using a fist to avoid bone fracture replacement caused by insertion of the intramedullary nails. Importance of tip-apex distance: tip-apex distance is of extremely important significance for preventing spiral blade cutting out. When a screw is inserted into the femoral head, the tip-apex distance should be < 25 mm. A 20-mm tip-apex distance is a very reliable index and its position should be in the center of or anterior and inferior to the femoral head. The position of the spiral blade should be in the lower one-third of the femoral head, and a center position better contributes to angular formation and rotation stabilization. For patients with good bone matrix, sufficient intramedullary cavity expansion is necessary for insertion of the spiral blade, while for patients with poor bone matrix, only the lateral femoral cortex is drilled. Three time points are selected for collecting outcome measures: prior to surgery (baseline), and 3 and 6 months after PFNA implantation. The percentage of patients having PFNA implantation-related safety complications, manifested as pain in the affected region, wound nonunion, incisional infection and gross findings observed at the time of nail removal, including inflammatory reaction, tissue proliferation and the appearance of a fibrous capsule wall. Fracture healing: evaluated by X-ray images. Hip joint function: evaluated by Harris hip scores (Harris, 1969). Surgery-related conditions: operative time, intraoperative blood loss, duration of intraoperative fluoroscopy. Patient's quality of life: evaluated by EQ-5D (EuroQol Group, 1990), composed of a questionnaire and a utility value conversion table. The former comprises the EQ-5D descriptive system and the EQ visual analogue scale. The descriptive system comprises five dimensions: mobility, self care, usual activities, pain/discomfort, and anxiety/depression. However, each dimension has three levels: no problems, some problems, and extreme problems, scored 1, 2, and 3 respectively. The EQ visual analogue scale is a vertical visual analogue scale with the top endpoint anchored at 100, indicating the best imaginable health state and the bottom endpoint anchored at 0, representing the worst imaginable health state. The EQ-5D asks respondents to simply score their health on that day. The utility value conversion table is a scoring algorithm, by which the EQ-5D score can be obtained, and this score indicates the degree of heath of the individual respondent. 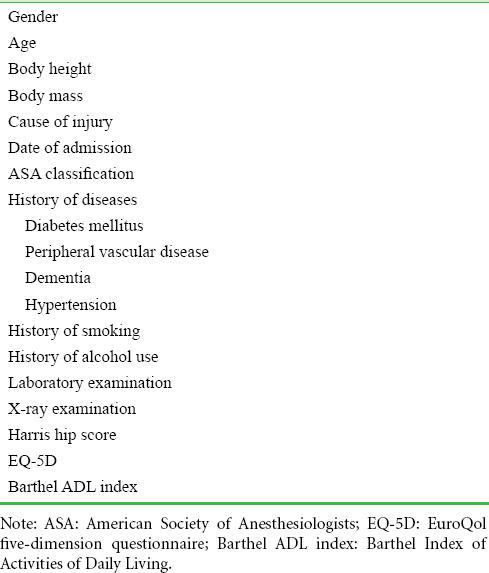 Barthel ADL Index: the Barthel ADL Index (Sulter et al., 1999) is used to evaluate a patient's activities of daily living. Its total score ranges from 0 to 100, with higher scores indicating better activities of daily living: scores of 0-20 indicate extremely severe dependency, 25-45 severe dependency, 50-70 moderate dependency, 75-90 slight dependency, and 100 normal. Schedule of the trial procedure is shown in [Table 5]. Data collection: according to trial design type and requirement, a table will be developed to record trial data. The recorded data will be input into an electronic database using a double-data entry strategy by trained professional staff. Data management: information accuracy will be checked when all recruited patients are followed up. The database will be locked by the researcher in charge and will not be altered. All information relating to this trial will be preserved by Chaohu Hospital of Anhui Medical University. Data analysis: the electronic database will be fully disclosed to a professional statistician for statistical analysis. Data open access: anonymized trial data will be published at http://www.figshare.com. Statistical analysis will be performed using SPSS 19.0 software (IBM Corp., Armonk, NY, USA). Normally distributed continuous variables will be expressed as mean ± standard deviation, and non-normally distributed variables will be expressed as median and quartile. Categorical variables will be expressed as counts and percentages. Paired t test or Wilcoxon test (paired samples) will be used for comparison of continuous variables between baseline data and post-implantation data. The chi-square test will be used for comparison of categorical variables between baseline data and post-implantation data. A level of P < 0.05 will be considered statistically significant. Trial progression will be reported to the ethics committee of Chaohu Hospital of Anhui Medical University every 6-12 months, and the trial's status will be updated in the registration database. Trial data will be maintained in paper and electronic forms. Electronic data will be preserved in a dedicated password-protected computer and managed by a data management professional. Data reported on paper will be preserved in a secure, locked place for future viewing. Few case series and randomized controlled studies are reported on PFNA implantation for the treatment of intertrochanteric femoral fracture. The majority of reports are case series, but most of these are retrospective studies and lack prospective, objective, rigorous scientific design and are thus not objective and reliable in their results. Although the current study is also a case series, it is a prospective design which can effectively avoid data bias. A case series is a type of medical research study that tracks subjects with a known exposure or examines their medical records for exposure and outcome. It consists of two types, one includes only therapeutic outcomes and the other includes the comparison between baseline and post-treatment (Liu, 2006). The case series method is not simply the integration of many case reports, but specifically refers to a self-controlled case series method (Whitaker et al., 2006). It evolves from case control studies and cohort studies and uses a self-control method to only observe the relative event incidence in the case group. Case series analysis is used to evaluate the relative incidence of clinical events after intervention (or exposure) within a pre-defined time limit and then self-compare with the outcome within another time length without exposure (Farrington, 1995). Case control study design can be influenced by many unavoidable biases and confounding factors, while cohort study design requires a large sample size and long observation time to ensure high reliability. When both of these study methods are not suitable (Farrington et al., 1996), a modified method based on them comes into being. This is one of the reasons we chose to perform the study with this design type. To the best of our knowledge, few studies are reported on the biocompatibility of PFNA for the treatment of intertrochanteric femoral fracture (i.e., pains, infection, wound healing, inflammatory reaction around the nail channel) as a primary outcome measure through a self-controlled case series. In addition, we will also use EQ-5D to evaluate the patient's quality of life after PFNA treatment. This outcome measure is rarely reported in previous studies. The 36-Item Short Form Health Survey is mainly used in the previous studies to evaluate quality of life after intertrochanteric femoral fracture treatment with intramedullary nails (Zhang and Zou, 2014; Li, 2015). This self-controlled case series study will be powered to provide objective and quantitative evidence to validate the safety of PFNA implantation in the treatment of intertrochanteric femoral fracture and the therapeutic effects of PFNA implantation on quality of life, bone healing, activities of daily living, and hip joint function. Recruiting is ongoing at the time of submission. JJX conceived, designed the trial protocol, wrote the manuscript, and will be responsible for data collection and processing. JJX agreed the final version of this manuscript for publication. Bergeron E, Moore L, Fournier K, Gravel C, Lavoie A (2009) Patients with isolated hip fracture must be considered for surgery irrespectively of their age, comorbidity status and provenance: a statement applicable even to nonagerians. Arch Orthop Trauma Surg 129:1549-1555.
de Vries JS, Kloen P, Borens O, Marti RK, Helfet DL (2006) Treatment of subtrochanteric nonunions. Injury 37:203-211. Farrington CP (1995) Relative incidence estimation from case series for vaccine safety evaluation. Biometrics 51:228-235. Farrington CP, Nash J, Miller E (1996) Case series analysis of adverse reactions to vaccines: a comparative evaluation. Am J Epidemiol 143:1165-1173. Fung W, Jonsson A, Buhren V, Bhandari M (2007) Classifying intertrochanteric fractures of the proximal femur: does experience matter? Med Princ Pract 16:198-202. Garg B, Marimuthu K, Kumar V, Malhotra R, Kotwal PP (2011) Outcome of short proximal femoral nail antirotation and dynamic hip screw for fixation of unstable trochanteric fractures. A randomised prospective comparative trial. Hip Int 21:531-536. Helwig P, Faust G, Hindenlang U, Hirschmüller A, Konstantinidis L, Bahrs C, Südkamp N, Schneider R (2009) Finite element analysis of four different implants inserted in different positions to stabilize an idealized trochanteric femoral fracture. Injury 40:288-295. Huang YF, Huang LX, Jiang DH, Cao ZH (2012) Analysis of therapeutic efficacies on the second generation of proximal femoral nail anti-rotation in the treatment of 47 cases elederly patients intertrochanteric fracture of femur. Zhongguo Yiyao Daobao 9:35-37. 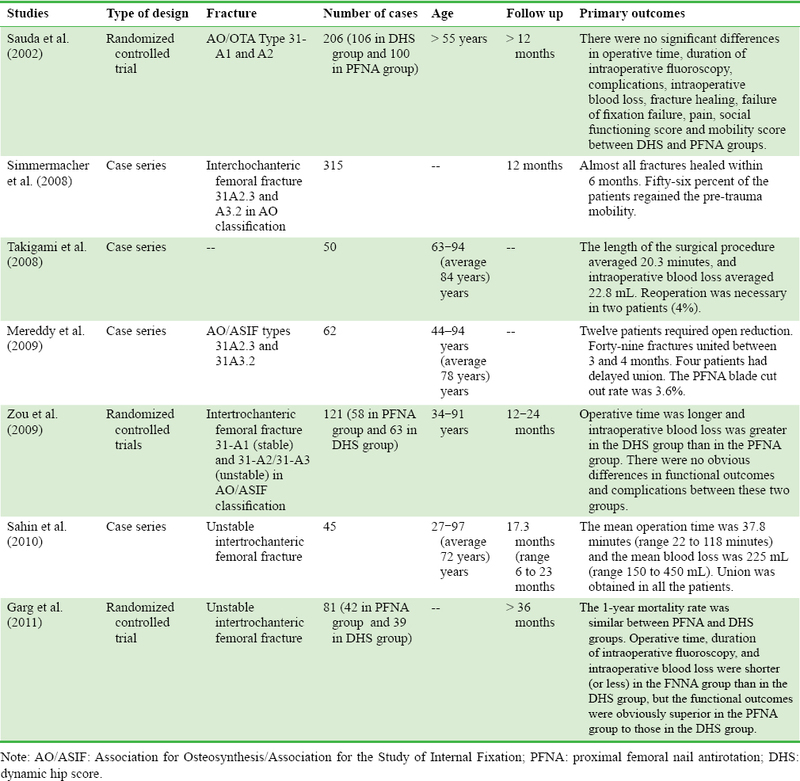 Huang FQ, Xiao XZ, Deng JL, Wang JM, Li XR (2015) Clinical comparison of PFNA in the treatment of intertrochanteric fracture in the elderly with two different body positions. Shiyong Guke Zazhi 21:448-450. Ju JW, Ye Z, Zhu J, Yan B, Zhang JL, Luo WH, He SJ (2014) Locking plate versus PFNA in the treatment of intertrochanteric fracture in the elderly. Zhongguo Shangcan Yixue 22:41-42. Kuzyk PR, Bhandari M, McKee MD, Russell TA, Schemitsch EH (2009) Intramedullary versus extramedullary fixation for subtrochanteric femur fractures. J Orthop Trauma 23:465-470. Liu JP (2006) Evidence based Chinese Medicine Clinical Research Methodology. Beijing: People's Medical Publishing House. Liu Z, Tan WF, Chen B, Lei CY (2014) Effect of closed reduction PFNA internal fixation in treating femoral intertrochanteric fracture. Chuangshang Waike Zazhi 16:163-164. 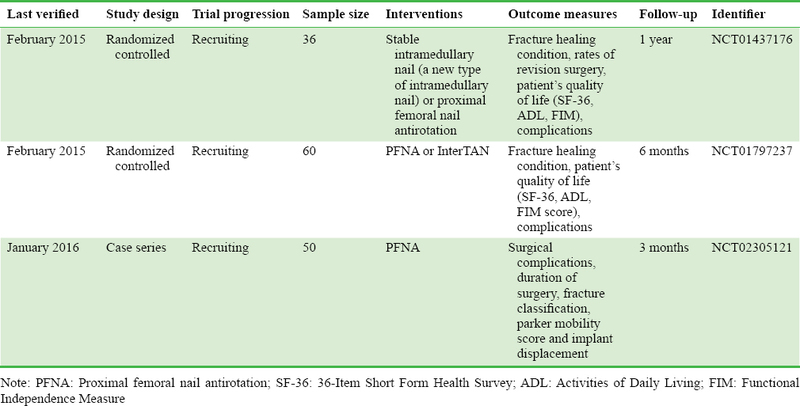 Mereddy P, Kamath S, Ramakrishnan M, Malik H, Donnachie N (2009) The AO/ASIF proximal femoral nail antirotation (PFNA): a new design for the treatment of unstable proximal femoral fractures. Injury 40:428-432. Qu L (2016) Clinical observation on treatment of femoral shaft fracture with ipsilateral femoral intertrochanteric fracture with different fixation methods. Xiandai Yiyao Weisheng 32:248-249. Ruecker AH, Rupprecht M, Gruber M, Gebauer M, Barvencik F, Briem D, Rueger JM (2009) The treatment of intertrochanteric fractures: results using an intramedullary nail with integrated cephalocervical screws and linear compression. J Orthop Trauma 23:22-30. Sahin S, Ertürer E, Oztürk I, Toker S, Seçkin F, Akman S (2010) Radiographic and functional results of osteosynthesis using the proximal femoral nail antirotation (PFNA) in the treatment of unstable intertrochanteric femoral fractures. Acta Orthop Traumatol Turc 44:127-134. Saudan M, Lübbeke A, Sadowski C, Riand N, Stern R, Hoffmeyer P (2002) Pertrochanteric fractures: is there an advantage to an intramedullary nail? : a randomized, prospective study of 206 patients comparing the dynamic hip screw and proximal femoral nail. J Orthop Trauma 16:386-393. Shi D, Gu DY, Jing X (2015) Clinical study on the treatment of elderly patients with intertrochanteric fracture by closed reduction and proximal femoral nail anti rotation. Zhongguo Shiyong Yiyao 10:102-103. Simmermacher RK, Ljungqvist J, Bail H, Hockertz T, Vochteloo AJ, Ochs U, Werken Cv; AO - PFNA studygroup (2008) The new proximal femoral nail antirotation (PFNA) in daily practice: results of a multicentre clinical study. Injury 39:932-939. Takigami I, Matsumoto K, Ohara A, Yamanaka K, Naganawa T, Ohashi M, Date K, Shimizu K (2008) Treatment of trochanteric fractures with the PFNA (proximal femoral nail antirotation) nail system - report of early results. Bull NYU Hosp Jt Dis 66:276-279. Whitaker HJ, Farrington CP, Spiessens B, Musonda P (2006) case series method)[Tutorial in biostatistics: the self-controlled case series method. Stat Med 25:1768-1797. Yan HS, Guo JM, Liu J(2015) Therapeutic effects of closed reduction and PFNA internal fixation versus artificial femoral head replacement on intertrochanteric fractures in elderly patients. Zhongguo Shangcan Yixue 23:43-44. Zhang W, Zou J (2014) Comparative effectiveness of INTERTAN intramedullary nail and sliding hip screw in treating intertrochanteric or subtrochanteric fracture of elderly patients. Zuzhi Gongcheng yu Chongjian Waike Zazhi 10:100-103. Zou J, Xu Y, Yang H (2009) A comparison of proximal femoral nail antirotation and dynamic hip screw devices in trochanteric fractures. J Int Med Res 37:1057-1064.